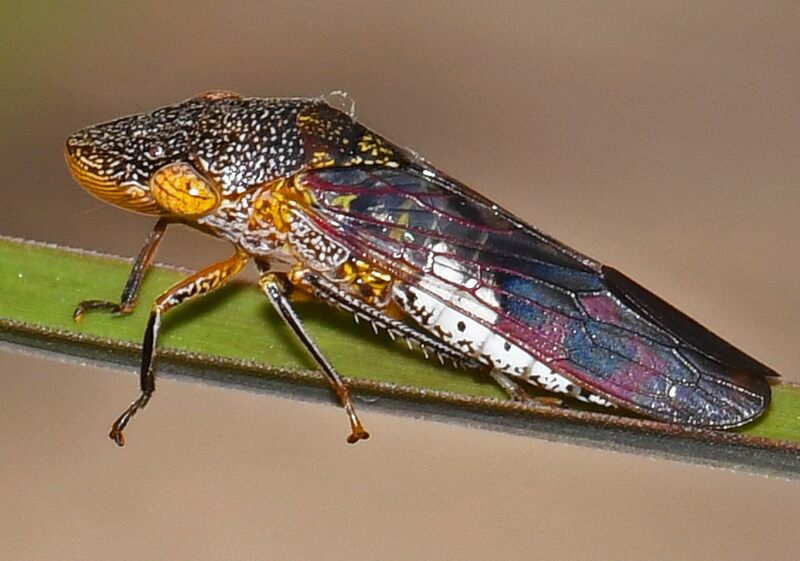 Description: A large leafhopper, adults are 11-14 mm in length and have a large flattened head. 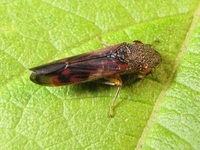 This species has a blackish head and thorax with white spots, and the sides of the abdomen are a mixture of black and white patches. 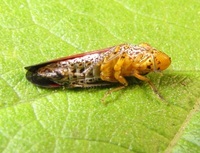 Wing veins are reddish to brown in color; the base half of the wings have "glassy" or transparent wing patches while the other half is dark in color with red, brown, and black patterns. 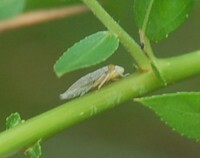 The face and legs of adults are yellow-orange. 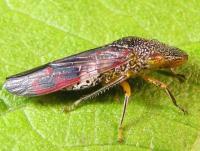 The underside of the abdomen is speckled black and white, and the head and thorax are yellow. Nymphs shape-wise resemble the adults, especially the head; they have a grayish to brown body. 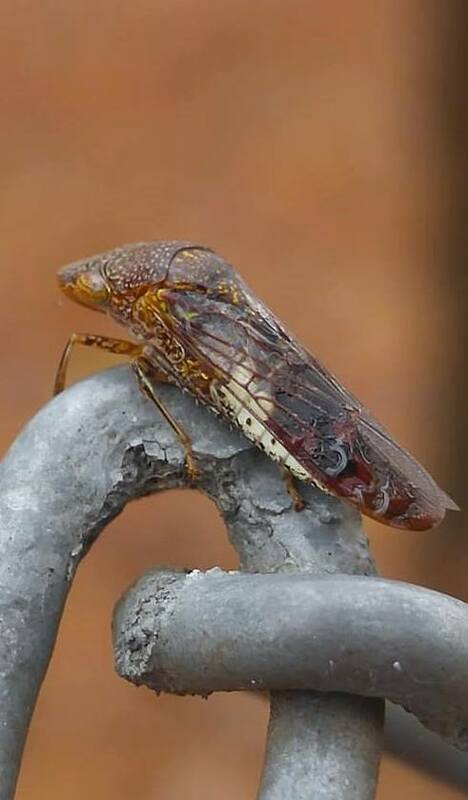 For additional pics of adults, see Glassy-winged Sharpshooter. Abundance: Uncommon, recorded from several counties in the Piedmont and Coastal Plain; probably more abundant in the state in the right habitat. Habitats: Found in grassy/brushy areas during much of the year, and hibernates in the forests during winter months. Behavior: This species peaks in number during the summer months, with population declines starting around late August as Fall approaches. 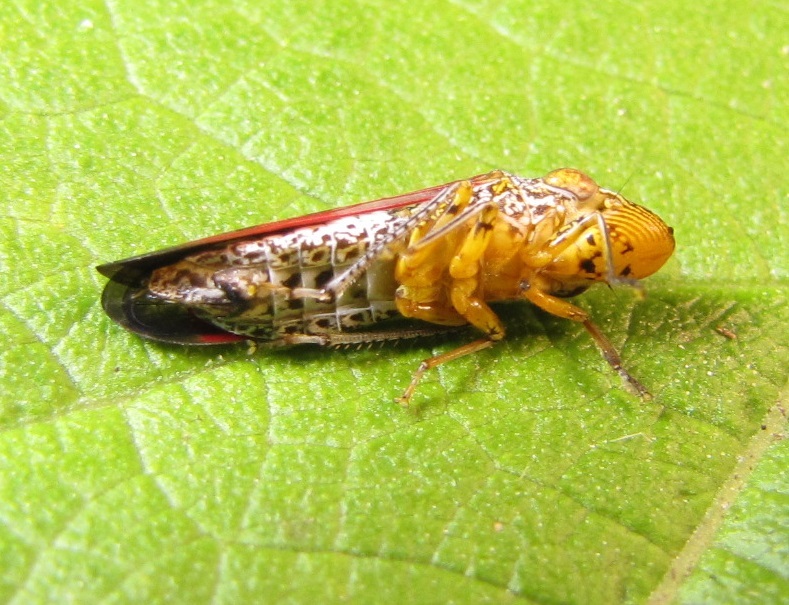 Before winter, adults migrate into forests and undergo incomplete hibernation until spring. 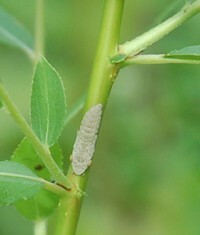 Mating occurs in the spring and summer (GWSS). Glassy-winged sharpshooters tend to feed on last-year's growth and meristematic growth, excreting large amounts of liquid as they feed. They ingest 100 to 300 times their dry body weight in xylem fluid per day and in large populations their high volume of excreta ("leafhopper rain") can become a problem, leaving white residue on leaves (GWSS). Comment: Weedy area near a trees.